Pokémon HeartGold​ (ポケットモンスター ハートゴールド, Poketto Monsutā Hātogōrudo?, "Pocket Monsters HeartGold") and Pokémon SoulSilver (ポケットモンスター ソウルシルバー, Poketto Monsutā Sōrushirubā?, "Pocket Monsters SoulSilver") are enhanced remakes of the 1999 video games Pokémon Gold and Pokémon Silver. The new titles are members of the Pokémon series of role-playing games, and were developed by Game Freak and published by Nintendo for the Nintendo DS. They were released on September 12, 2009, in Japan, and will be released on March 14, 2010 in North America and March 28, 2010 in Europe. 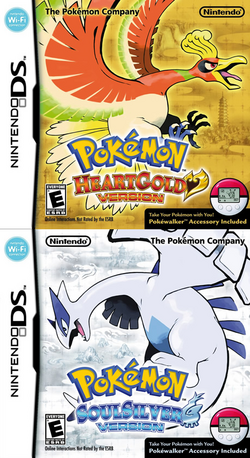 HeartGold and SoulSilver take place in the Johto region as in Pokémon Gold and Silver. After completing the main storyline, players can also go to the Kanto region, similarly to in the original Gold and Silver. Unlike the Pikachu in Pokémon Yellow, HeartGold and SoulSilver will allow any Pokémon the player owns to follow him or her in-game on the overworld. The player may talk to the Pokémon, and occasionally it may pick up certain secret items. This page was last edited on 26 December 2018, at 02:04. This page has been accessed 174,626 times.